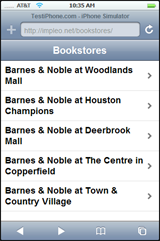 I built a small web application specifically for the iPhone last year to search the availability of a book in bookstores. I think I came up with the idea for it when I was at a local Barnes & Noble store, couldn’t find what I was looking for, and wondered if another store close by had it in stock. The application works by allowing the user to search for a nearby Barnes & Noble store based on a zip code, and also allows you to search the stock of those nearby bookstores for a book, given its ISBN. Try it out now and let me know what you think.